Last year when I joined the Homeschool Review Crew and was given access to SchoolhouseTeachers.com, one of our favorite resources was the Drive Thru History videos. Mr. Intellectual watched all of them that were on there, and wished he could watch the new series, The Gospels. We were in the wrong part of the world to get on the review team for that one last year, though, which really disappointed him. This year, he was very excited when the Drive Thru History Adventures review came up and it was available worldwide! He had been rewatching the American History videos, along with Mr. Sweetie, and was thrilled at the thought that he could now watch the Gospels ones, as well. He was delighted when we were chosen to review Drive Thru History, and spent some time with it immediately, although, because of our move, he didn’t have time to get back to it for a couple of weeks. Since then, though, he has been using it every school day. Mr. Intellectual has been working his way through the lessons labeled Bible History. These go through the life of Jesus. The narrator, David Stotts, goes to places such as Nazareth, Jerusalem, or Bethany, for example, and tells the story of what happened in the life of Jesus. The story really comes to life as you see the place as you hear the story. He also shows or talks about artifacts related to the subject quite often. My boy feels like watching these has helped him to understand the Bible better. The main that stood out to him was the artifacts that help to confirm the Biblical account. There are 18 lessons in the Bible History Adventures part of the curriculum. Each lesson includes a 30-minute video, artwork and photos relating to the topic, Scripture readings from the part of the Gospels that are being discussed here, “Side Roads” about related topics, discussion questions, worksheets, and Digging Deeper articles (which Mr. Intellectual has just admitted he doesn’t read). The lessons are supposed to be spread out over a week, but we’re doing one a day, as the amount he’s doing only takes about an hour. We haven’t had time to use the lessons for American History Adventures or Ancient History Adventures yet. He has watched all the videos, about a year ago, and will probably watch them again sometime. There are 12 lessons for American History, starting with the discovery of America and going through the signing of the Constitution. The lessons are laid out the same way as the Bible History lessons. There are also 12 lessons for Ancient History, also laid out the same way. These include the founding of Rome and the persecution of Christians by Rome, the spread of Christianity, the beginnings of democracy in Greece. There are also trips to what is now known as Turkey as we follow the spread of the early church. I noticed that a number of these videos are 45 minutes long. 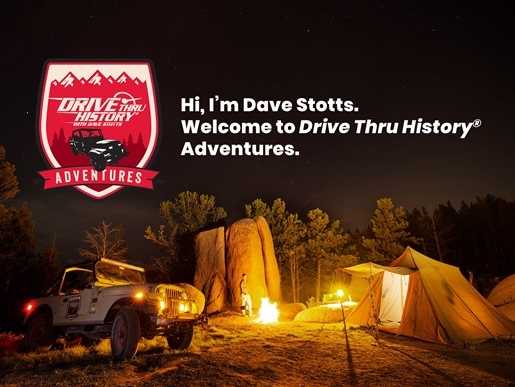 If you need a way to make history come alive, Drive Thru History Adventures might be the perfect fit. Not only are these videos very informative, they are also entertaining. Boys will especially like the parts where Dave Stotts goes off on a rabbit trail, talking about his wonderful vehicle! I’m not much for vehicles, but it is funny sometimes. Apparently, he was telling once how wonderful his Land Rover was, and dropped the keys. Another time, he did a Car-B-Que, using his engine to cook his meal. (I’m not sure I want to try that one, judging by what I was just told about it!) I’m very glad we got to review this site, and we will be going back to it throughout the year. One thing I just learned—apparently, there is a code for 20% off a year’s subscription, in the most recent issue of The Old Schoolhouse Magazine, so if you read that, search for the code. Oh, one more thing—we got some fun mail from Drive Thru History this week! Living where we do, it is rare and exciting to get mail from America, so it was an extra-special thank you for being part of this review. They sent two iron-on badges and two large stickers, as well as a large post card. What fun! This entry was posted in Activities at Home. Bookmark the permalink.